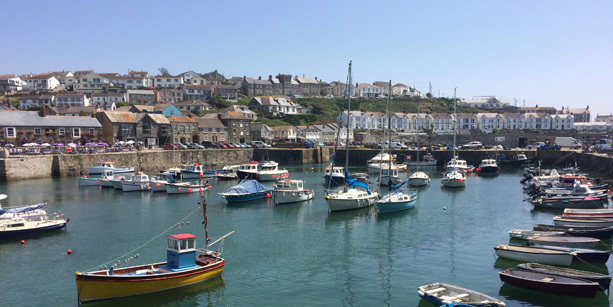 With the school summer holidays in full swing, here are some child friendly activities to do with the family in Porthleven this summer. A day at the beach is not only fun but it’s also free. Whether it’s paddling in the water, building sandcastles or playing beach games, there are lots of things to do to keep the kids entertained and certainly tire them out. Located a short stroll from the harbour, Porthleven beach is a small but lovely sand and shingle beach which at low tide stretches three miles south west to Loe Bar and Gunwalloe Cove. The beach is also perfectly situated close to the local shop and ice cream parlour. With miles of stunning walks near Porthleven, there are many coastal routes to choose from depending on the age and enthusiasm of your little ones. One of our favourites is the Porthleven to Rinsey Head coastal walk. Making your way past The Ship Inn, up the hill, following the signpost to Rinsey and towards the gate marked “Wrestling Fields”, this lovely coastal walk is the perfect way to spend some quality time with the kids. With beautiful coastal views, pretty flowers and lots of wildlife, this walk definitely ticks all the boxes, even for the family pooch. If you’re looking for a cycle trail suitable for the whole family then look no further than The National Trust’s Penrose. Featuring a mixture of farmland, woodland, open parkland and stretches of coastline, this cycle trail running from Porthleven to Helston is a fantastic route for the kids to explore, even those on stabilisers. Having worked up an appetite from a day on the beach, exploring the coast or enjoying a bike ride, head to Rick Stein’s for a family meal. With dishes like fish tacos, chargrilled chicken breast in a brioche bun with chips, and jelly and ice cream, our children’s menu will certainly satisfy your little one’s appetite. Our à la carte and set menu will also offer plenty of choice when it comes to trying some of Rick’s favourite fish and shellfish dishes. View our children’s menu here.